visit www.missmamosworld.com - This is no longer being updated! You know that something good IS gonna happen... If it doesn't, close the browser! A few weeks ago, K was asked to try out HealthSpan's Omega 3 Brain Boosters Orange Chewable Capsules for Children. I agreed because K doesn't eat much oily fish so I figured he was lacking in essential omega 3 and could do with a boost of it every day. M felt left out so I asked her actual Mum and she thought the same as I did! So they agreed to help me write this. The package arrived and the box was not what we all expected. Usually health supplements like this are unattractive and the packaging is more aimed at the grown ups who buy than the kids who consume. Brain Boosters where totally different, the box was bright yellow with orange lettering emblazoned on the front of the box. The kids both seemed impressed and could not wait until they got to try one. The instructions advised to take one tablet, twice a day. They both agreed on one at breakfast and one at dinner and then split the contents in two so M could take some home with her. Both of the kids took the tablets as directed until they had consumed them all. K said he liked the taste. Very orangey and a bit like fanta oranges. He also said he felt a bit more alert but I'm sure that was because he expected to have a huge brain capacity by the end of the trial! M said they tasted good too but she didn't specify a type of orange it was similar to, she said it was a nice orange flavour. She said it didn't feel like she was having something good for her because it was like a chewy sweet. Pretty much the same thing that K mentioned about them too was how they didn't really feel healthy. They were both eager to eat one every time! Apparently, each tablet is packed full of the Omega 3 essential fatty acids DHA & EPA. Every single Brain Booster capsule has been distilled. This process has removed the saturated fats, cholesterol and pollutants. They claim to be the purest brand available. Just in case you didn't know, essential fatty acids are essential to your body, especially to kids because the body does not make enough to supply your needs and so they must come from your diet in some way. Oily fish such as salmon, halibut, tuna are a great source of omega 3, but according to statistics only a third of the population eat it on a regular basis. Omega 3 is also in kidney beans and walnuts, not things that smaller kids willingly eat imho and I thing that is why there are supplements such as these available. The HealthSpan website also state that the tablets are not clinically proven to boost brains. It also states that two chewable capsules contain 362mg total omega 3 including 180mg DHA and 120mg EPA. So, have I/we noticed any changes in the kids during the duration of the trial? Well, K went up 2 levels in maths, he did also start 1-2-1 tuition once a week around the same time but he has the concentration span of a gnat when it comes to mathematics. He also went up a level in literacy and speaking and listening. M went up a level in maths and 2 levels in reading. Not too sure if it was because of the omega 3 or not, but the trial is over now and they are no longer taking the supplements so I guess we will see what happens in the next few weeks in terms of concentrating and learning. If there is then the price is reasonable enough to buy some more without breaking the bank. 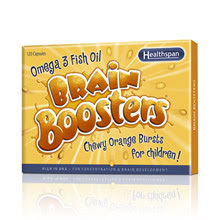 The Brain Booster capsules cost £9.95 for 120 capsules, that's a 60 day supply for one child or a 30 day supply if you have two (or in my case an extra one!) and are available on the HealthSpan website where delivery is FREE with every UK order! The Brain Booster Capsules were provided free of charge to me for the purpose of this review. The fact that they were free did not in any way influence what I wrote in this review and if the product was a load of rubbish I would have told you anyway. Thanks to the kids for their guinea-pig abilities when testing this product. No actual guinea pigs were used or harmed in any way during this trial, neither were the children! never really very sure of what i think of products like this! Recipes, Reviews, Competitions and musings of a positive thinking, tea drinking, self employed crazy! Copyright - Stephanie Mamo - Miss Mamo's World - 2013. Simple theme. Theme images by Jason Morrow. Powered by Blogger.